I thought the Judge was going to let one member of defense and one member of the State know the evening before and the others would be notified before 8 a.m. on the day of, which would allow them to drive to the venue in time. He said it would be 45 mins. - an hour's drive from Orlando. Thats what I thought was how it went down also Can. Remember Mr. Ashton was upset because he needed/wanted time to take care of family matters and was told basically if he couldn't deal with a short notification there were other ADA's that could take his place or some such wording. The way I understood this was as two different times and issues. 1. One member of each team (defense and prosec) would be told the location and other specifics today..to make preparations for their respective teams and have everything in place. 2. 24 hours prior, then each team member would know the location..as well as the press. Why the press thought they need to know now is beyond me. Jeff knows the day and time of the jury selection to start...he has time to prepare now to know that he will be expected at another location on that day. He just doesn't know where...he does know when. I am wondering who on each team was going to get this info ..now that would be interesting. Chief Judge Belvin Perry has previously said that May 2 would be the day he will tell one person from the defense team and one from the state attorney's office where they will go to select a jury for the trial. Meant to mention that video of today's hearing is also posted at above link. In 3 parts. Thanks Brandi! I can't wait to watch it again. Not sure if it was posted here at at another site, but someone said they emailed Ms Belich about whether jury selection would be streamed and she said it would. Is that correct? I don't think they will stream it. They are back and I have NO sound! Caught that, wish I knew what was said! Her friend looks scared chitless! I missed the whole thing bec. I had the black screen of death at work. Would he address Sindy about her motion? I don't really think so. I'll get back to reading...just wanted to comment on those priceless facial expressions. Maybe he told her about her gum chewing. The media attorney stated that the parents put themselves in the media and CA mouthed "EXCUSE ME" and then showing absolute hatred in her face, no smirk, no movement, just glaring hatred. 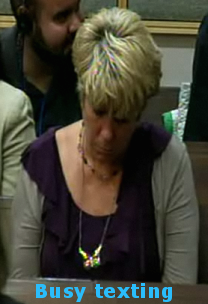 why is Cindy allowed to have anything to drink in the courtroom? I got a dirty look when I popped a bite of donut in my mouth cause I didn't get lunch..the deputy looked at me and shook her head 'no'..and court had not even started back up yet! Cindy has either pop or juice in that bottle looks like to me..why is this ok???? It's probably vodka or gin. Thank you so much Seeme. Is it just me? Or did anyone else see that weird shakng of her head she was doing? What was that? Are you talking about Cindy? If so, I had questioned about that too. It looked like she was shaking, her whole body, to me. But her head also looked as if if was nodding, so I didn't know what was up. Face it, they all have to be pretty skeered about now! I hope they reap what they've sown. Once again this woman can not keep her mouth shut or show any sort of composure at all..not even in a court of law. She better be glad she is sequestered..if not she would be taken away by the bailiff for her constant disruptive attitude. What part of no facial expressions, no talking, no head shaking, no gum, no drink and no food and no texting does she not understand? These are the most hardheaded people I have ever seen..they act like a bunch of pubescent teens with a hatred of authority complex. Grow up Cindy..the world does not revolve around you and your demented offspring. 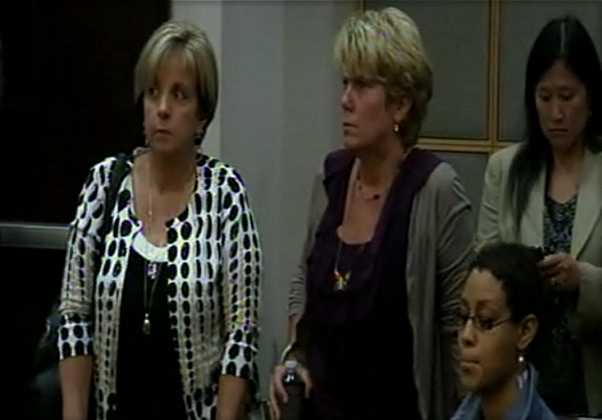 Cindy - did anyone else see that weird shaking of her head she was doing in court today? Yes, Seeme ...thanks for this link! There were big xeroxed notes taped on the back of each pew showing a comic and stating no chewing gum, no hands in pockets, no bottles, no cell phone use. Only the press is allowed to use laptops/texts. Didn't notice the gum chomping today, but can't recall a hearing when she wasn't chewing gum. Wasn't the head shaking about the media attorney's comment to the judge that Cindy and the family had put themselves out there in the media? Yes, thank you Seeme. See? This is why Cindy must be sequestered during trial, George too, he's just as bad. They will never stop trying to get their lying point across to anyone who will listen. This must stop in the courtroom now. It's bad enough they will say who knows what while on the stand. Their theatrics from the gallery should be excluded from the get go right through to the sentencing phase. is casey praying? she seemed distant from baez and he from her today or is it me as I missed the trial and watched it after the fact.